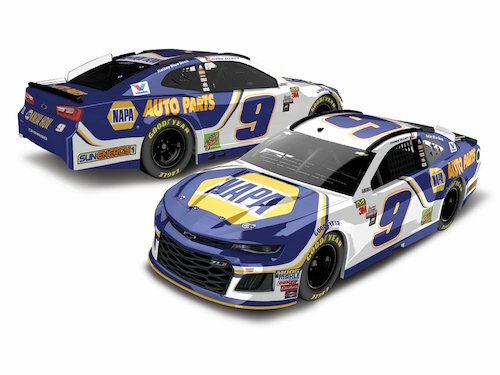 “Chase Elliott’s NAPA Chevrolet was our best-selling die-cast of 2018! Who else made the list?” read a tweet from the Lionel Racing’s official account (@Lionel_Racing), along with a link to the top-10 sales list for last year. Elliott paint schemes were first and second on the list, with his regular NAPA paint scheme leading 2018 sales of Lionel die-casts. His Watkins Glen (N.Y.) International race win-car was second on the list. In all, five of Elliott’s cars were in the top-10, and Hendrick Motorsports cars occupied the top-eight positions on the list. Also in the top-10 of die-cast sales from last year were Elliott’s Hooters pain scheme and die-casts recognizing Elliott’s other wins from 2018 at Dover (Del.) International Speedway and Kansas Speedway. All four Hendrick Motorsports drivers had at least one paint scheme on the list. William Byron’s regular Axalta paint scheme, Alex Bowman’s Nationwide scheme, and Jimmie Johnson’s Lowe’s paint scheme ranked third, fifth, and seventh on the list, respectively. The only two non-Hendrick Motorsports drivers with die-casts in the top-10 of 2018 sales were Kyle Larson and Kevin Harvick. Larson’s Credit One Bank paint scheme ranked ninth, and Harvick’s Busch Beer paint scheme was 10th.